(b)orders was a one evening event which explored the relationship between the present shifting political geography instigated by countries constructing border fences and the migrants and refugees who now mainly live their lives suspended in demarcated zones in a precarious state of survival or even violently displaced within their own country. According to researcher, Elisabeth Vallet, from Quebec University in Montreal, there are currently seventy walls placed around the world to protect national borders, compared with twelve in 1989 when the Berlin Wall came down. The Ukraine, Estonia, Austria and Slovenia have either commenced constructing a border fence or are considering building one. Greece, Bulgaria, Britain (Calais), Turkey and Hungary have already completed their border fences. The dream of an open united Europe is collapsing and its border-control-free Schengen Area is in practise, no longer legitimate. We are now living in times where goods can travel more freely than people, and mega corporations dictate state policies and border controls. Responding to these concerns, NeMe presented two artists whose work examines the present issues of national borders and refugees. 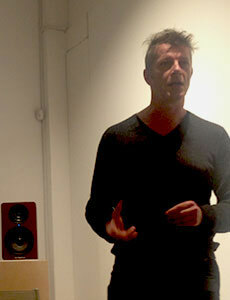 Tony Maslic spoke about a video he created for the exhibition nEUROsis. Filmed over a period of three months at the edge of central Athens, the video is a modest witness of how international and local authorities are failing to solve the humanitarian and economic crisis. The unacceptable situation in the refugee accommodation centre appears as if the EU is maintaining these conditions to either intentionally deter more refugees from arriving, or simply because of incompetence due to a lack of will to find a humanitarian solution. Both reasons are alarming, revealing a crisis of ideology rather than a crisis of finance, where people are instrumentalised into political tools, with the demise of human rights. Open borders are transforming into high voltage charged fences protecting xenophobia, isolationism, corporate colonialism and exploitation, all within the constitutional framework of an increasingly divided European Union. In the course of the past three years, Aron Rossman-Kiss has undertaken a series of field trips along Europe’s borders and refugee routes, creating a body of work incorporating the voices and experiences collected during these journeys. Drawing upon his experience, he will evoke the artistic and ethical questions that can arise when working in such situations and the challenges one can face when working with themes already saturating mainstream media. © 2017-2019 NeMe and/or respective contributors. This site has 1857 posts since it was launched 14 years, 5 months and 5 days ago and it was last modified on 19 April 2019 at 3:19:46 pm UTC.